All businesses eventually become commoditized or die. Business is pretty bleak like that sometimes. There is a cycle through which all things that eventually become commmoditized must pass (depicted to the right). To understand this cycle, consider an innovation-- say, electric power. Simon Wardley describes the process (entire explanation here): "We started off with the invention of Wallaston, 1821. (innovation) The introduction of the first products like the Hippolyte Pixii (1830s) (product), and then onto the introduction of utility grids and eventually the national grid. (commodity)"
Innovations often come out of research and lead to custom-built solutions. Market participants find the most relevant features of these solutions and refine them into products. Through time, the products become so widespread and available through market pressure that they are virtually interchangeable with one another and very well-defined commodities. In other words, they are low-cost, ubiquitous and fungible (easily exchangeable like money or oil). The point of this is remind us all that almost everything in business-- publishing, dry cleaners, computer hardware, car dealerships, cloud computing, air travel, and even your own job-- are being (or have been) commoditized. Within many products, such as ERPs and transaction servers, there are multiple components each of which are also somewhere along the commoditization life cycle. 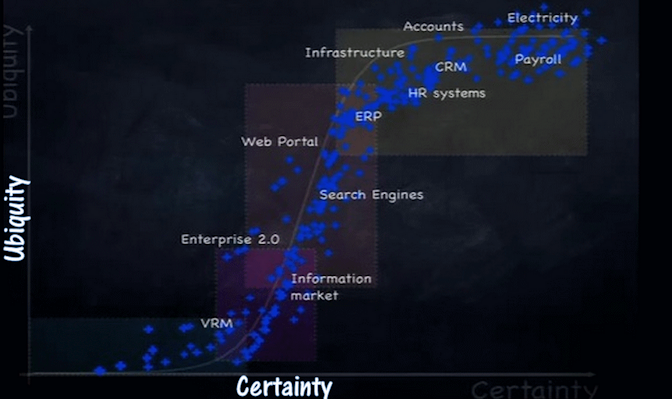 Shown below is Simon Wardley's research data depicting various technology-related components from 2010. So using Simon's chart, we show the three areas in this business cycle that we focus on. The YELLOW circle involves taking innovations, often from academia, and developing custom-built solutions for businesses. The GREEN circle comprises innovations that have been tried but need refinement to be viable. And the BLUE circle involves enhancing custom-built solutions into products. The greatest area for growth is in small and medium-sized businesses somewhere in these three circles.